Never mind pre-season friendlies, this weekend sees the return of ‘Proper Football’ with the start of the Championship, League 1 and League 2 seasons (alongside a whole host of others) and with it the hopes and dreams of many a football fan and punter! Yet, did you know that last season was one of the strangest on record as anyone backing each and every home team in the main UK leagues would have made a fine profit? It sounds bizarre, but it is true with a profit of 81.7 points at 3.4% ROI if backing all 2416 home teams in the top 4 English Leagues and the SPL last time out. This table is based on the results as taken from the football-data.co.uk website, which tracks the best early odds from a panel of 3 bookmakers. For many punters, such a statistic is like a dagger to the heart as the biggest priced bets are often found when backing the away team. The away teams are therefore usually taken as offering the ‘best value’ when considering who to bet upon. Although when I say best value it’s important to understand I don’t mean ‘most likely to win’ – its vital to separate out a need to pick out a winner, versus taking a value price. 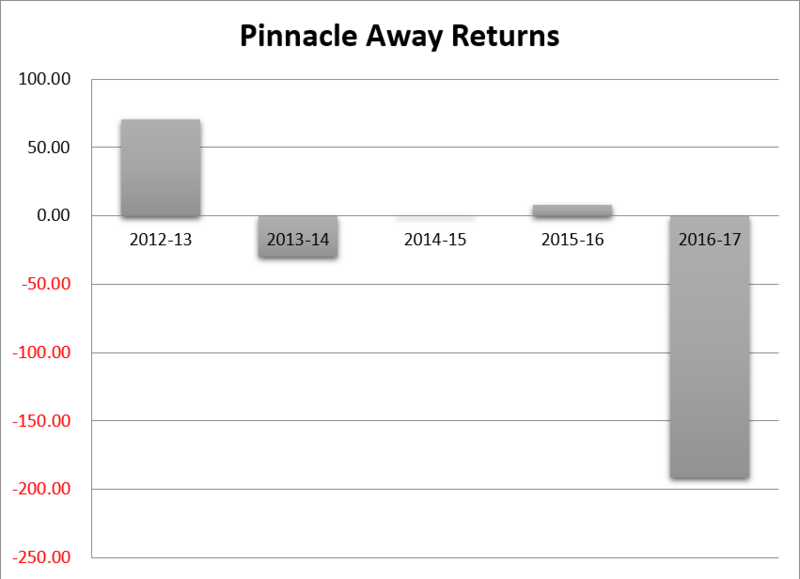 Again the 2016/17 season away bias is neatly reflected by this next graph which showcases the returns if blindly backing all away teams with Pinnacle Sports over the past 5 seasons. Taking the closing odds (those available just before each game kicks off), you can see how the 2016/17 season compared with a huge loss of nearly 200 points. The previous ‘worst’ season for backing away teams only was the 2014/15 season, which dropped just over 25 points. What Has Changed For Us Punters? Will this home side bias continue this season? Should you avoid backing all away sides altogether? Looking at the stats objectively and with an understanding that nothing has changed across the wider football world to give home sides an extra hidden advantage…the logic has to be that this is just a short-term pattern in play. Short-term might seem a strange term to suggest when looking at 2416 games and a full season, yet we have seen similar patterns before. A glance at the Pinnacle graph above from the 2012/13 season tells us that backing all away teams blindly made almost a 70 point profit that year…yet since this date such a strategy will have made an overall loss of over 200 points. Such seasonal trends also impact tipsters, so it takes a particularly talented expert or system to navigate them and still show a profit. Take for example, one of the top rated football system-based tipsters here at SBC, who despite the home-team bias, still managed to make strong profit with a 17.1% ROI last season. Due to his strict filters, he was able to filter out several potential (ultimately losing) away bets and end up with such a fine profit. Although his systems advised less bets than usual in an average season, it ensured his members were unaffected by this bias. His success last season was no fluke either as this system has made a profit in each of the last 5 seasons – averaging a 12.7% ROI across the board. You can read more about this tipster and several others in the recently released Football Tipster Guide for the 2017/18 season.. If you want to know about the best football tipsters (Plus horse racing, tennis, golf, nba, nlf and darts) then why not subscribe to the Smart Betting Club today and gain instant access to all these reports and more!